A.T. Equipment Sales guides colleges, universities and schools throughout NY on a variety of lockers for their buildings. If you’re looking where to buy school lockers, look no further. We partner with leading locker manufacturers for school hallway lockers, metal athletic lockers and all kinds of tier lockers. The price of lockers largely depends on the material, features and installation – we can help you with all of those decisions. School and gym lockers that are perfect for your school. School Lockers line hallways of school buildings to provide storage and security for books and personal items of students. And they pretty much just do what they’re supposed to do, unless they are tampered with. In case they are, we use heavy gauge steel lockers with accompanying reinforcements, should someone’s curiosity get the best of them. The good thing about purchasing quality lockers is that they last for many years. We don’t only sell and install school lockers; we also sell and install gym lockers. We’ve outfitted home and visiting teams with gym lockers that were branded with team colors; installed custom lockers and created private areas for school storage. 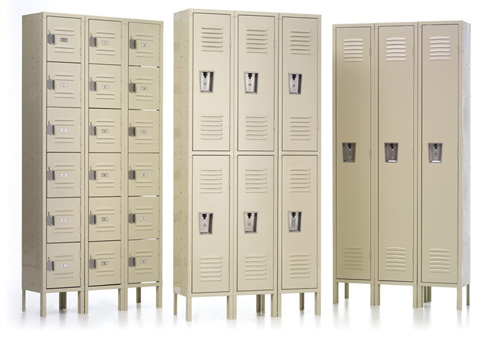 If you are looking for lockers in New York, please contact us at (914) 472-7222 in our Scarsdale, NY office to learn about our school and gym lockers. If you’d like us to do a site visit we can if you’re in any of the following counties: Suffolk County, Dutchess County, Sullivan County, Ulster County, Putnam County, Nassau County, Orange County, Westchester County or Rockland County. Get in touch with us and let us help you select the perfect locker for your school today, we look forward to hearing from you!